Goal update: March weight loss. March was a tough month. Unfortunately, I got a little out of my routine on my week-long business trip in the middle of the month. Suffice to say I wasn’t eating the best quality of food or exercising much that particular week. After starting the month at 207 lbs., I also ended March weighing in at 207. While I missed my goal by four pounds, at least I didn't gain. To get a big picture perspective, I’ve dropped a total of 11 pounds since January 1! However, if I am to reach my goal weight of 195 lbs in eight weeks I am going to have to pick up the pace. I now need to drop an average of 1 ½ pounds per week. If Al Gore is looking to purchase carb credits, he’s in luck. Mr. Gore, have your people call my people. Snow to take on cancer again. I was afraid of this when I first heard the news last week of his impending surgery. Without ever having met Mr. Snow, I admire him for his courage. I can’t imagine the emotional and physical toll it requires to battle cancer and beat it once, much less take it on a second time. "He said he's going to beat it again," Perino said in an emotional morning briefing with White House reporters. "When I talked to him, he was in very good spirits." I’m not a betting man but if I were, I wouldn’t think to wager against Snow. I will certainly be rooting for him every step of the way. Eddie Griffin + driving in March = Disaster! In this my 300th career blog post, I refer you to a couple of automobile mishaps involving guys named Eddie Griffin. In March 2006, NBA player Eddie Griffin crashes his SUV into a Minneapolis convenience store. Yes, he was drunk. But he also got distracted due to his watching adult DVDs on his portable video player…..while, uh, pleasuring himself. In March 2007 (this past Monday to be exact), actor/comedian Eddie Griffin destroys a $1.5 million Ferrari while practicing for a charity race. I happen to know that there is an Eddie Griffin who lives in my neck of the woods. I would just caution him to keep both hands on the steering wheel (ten o’clock and two o’clock, just like we learned in drivers ed) and don’t take the curves too quickly. Especially while driving in March 2008. 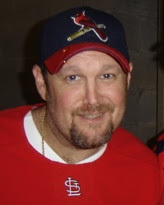 Separated at birth: Larry the Cable Guy & Matthew LeCroy. Comedian Larry the Cable Guy (left) and Major League Baseball player Matthew LeCroy. Despite the string of political defeats over the past 10-plus years, Keyes has captured the attention of many moral conservatives. Whether it’s his hard-line stance on the sanctity of life or his frankness in declaring the homosexual lifestyle as hedonistic, Keyes has maintained the ability to speak in a manner which continually eludes many mainstream politicians. I for one have applauded Mr. Keyes for his willingness to not compromise his principles for the sake of gaining political power. Since Keyes’ defeat in the ’04 Illinois Senate race, I must admit I’ve paid little attention to both his political and personal exploits. I guess that’s how I missed the February 2005 Washington Post article detailing the strained relationship between Keyes and his daughter, Maya. Maya Keyes loves her father and mother. She put off college and moved from the family home in Darnestown to Chicago to be with her dad on a grand adventure. Even though she disagrees with him on "almost everything" political, she worked hard for his quixotic and losing campaign for the U.S. Senate. Now Maya Keyes -- liberal, lesbian and a little lost -- finds herself out on her own. She says her parents -- conservative commentator and perennial candidate Alan Keyes and his wife, Jocelyn -- threw her out of their house, refused to pay her college tuition and stopped speaking to her. Unfortunately I haven’t heard Alan Keyes’ side of the story, other than a prepared statement to whoever contacted his office to inquire about his daughter. "My daughter is an adult, and she is responsible for her own actions. What she chooses to do has nothing to do with my work or political activities." Despite the strained relations, Maya is able to maintain a healthy respect for her father. "I disagree with nearly all his views, but he's very honest and has a lot of integrity." What isn’t specifically addressed is if Maya feels she has lost her parents’ love. In a situation like this I am quite certain that Alan Keyes, while strongly disagreeing with his daughter’s choices in life, is still able to maintain that unconditional parental love. However, it’s quite the balancing act for parents to explain to their children that they are still loved while at the same time being abhorred by their actions. Whatever the situation with the Keyes family, Alan has been put into a no-win situation. For condemning his daughter’s homosexuality, he’s called a bigot. But if he were to advocate Maya’s lifestyle choice while voicing disapproval for all others, he’d be labeled a hypocrite. My thoughts and prayers are with the Keyes family in the hope that they soon reconcile. The man who once proclaimed that Israel needs to be eliminated is now concerned about his country’s image-----because of a movie!! Iranian President Mahmoud Ahmadinejad on Wednesday called Warner Bros.' hit film 300 part of a U.S. propaganda campaign "to prevent our nation's development." In a recent “Break Point” commentary, we are given a history lesson on the Iranian population’s stunted growth. But after the war with Iraq, which killed between 500,000 and one million Iranian men, Iran’s high birthrate was viewed as a liability. In 1993, the government enacted a “family-planning” law that not only encouraged the use of birth control but also eliminated maternity leave after three children. The results were unprecedented: In seven years, Iran’s birthrate had dropped to less than replacement level, two births per woman. Iran’s population, which doubled between 1968 and 1988, was now growing at less than 1 percent per year. Oh, but Iran’s image was pristine after holding captive more than 50 American hostages for over a year in late 70s, early 80s. And they certainly solidified their squeaky-clean reputation Friday by taking hostage 15 British servicemen off the coast of Iraq. No, according to Iranian TV it’s a “Zionist conspiracy” that is causing the most damage to the country’s otherwise positive P.R. Syndicated columnist Charles Krauthammer has been a favorite of mine for several years now. Not only is he a fantastic orator and brilliant writer, Krauthammer also serves as an inspiration. Despite being paralyzed in 1972 due to a diving accident, he continued his studies in the medical field while going through rehabilitation. Krauthammer would earn his M.D. from Harvard Medical School in 1975. In his latest offering for Time magazine, Krauthammer fires intellectual shots at the sanctimonious rhetoric offered up by your friendly neighborhood global warmists. Goldman Sachs has been one of the most aggressive firms on Wall Street about taking action on climate change; the company sends its bankers home at night in hybrid limousines. Written without a hint of irony--if only your neighborhood dry cleaner sent his employees home by hybrid limousine--this front-page dispatch captured perfectly the eco-pretensions of the rich and the stupefying gullibility with which they are received. Leo and Al then portentously announced that for the first time ever, the Academy Awards ceremony had gone green. What did that mean? Solar panels in the designer gowns? It turns out that the Academy neutralized the evening's "carbon footprint" by buying carbon credits. That means it sent money to a "carbon broker," who promised, after taking his cut, to reduce carbon emissions somewhere on the planet equivalent to what the stars spewed into the atmosphere while flying in on their private planes. In other words, the rich reduce their carbon output by not one ounce. But drawing on the hundreds of millions of net worth in the Kodak Theatre, they pull out lunch money to buy ecological indulgences. The last time the selling of pardons was prevalent--in a predecessor religion to environmentalism called Christianity--Martin Luther lost his temper and launched the Reformation. Mr. Smith goes to Dinkytown. The University of Minnesota Golden Gophers have a new men’s basketball coach. Tubby Smith is leaving Kentucky after 10 seasons to take the head coaching job at Minnesota. Smith, who had four years remaining on his contract, will be introduced at a 1 p.m. ET news conference Friday in Minneapolis. A Kentucky source said that the school would still honor the $1.5 million incentive bonus that Smith is due on April 3. Smith informed Kentucky players and athletics director Mitch Barnhart about his decision earlier Thursday and also phoned former Minnesota coach Dan Monson, who was fired in November, to tell him he was accepting the job. In 10 seasons at Kentucky, Smith averaged 26 wins per year. He coached his teams to four “Elite Eight” appearance, including the national championship in his first season of 1997-98. The Wildcats made the NCAA tournament in all 10 of Smith’s seasons. Given that track record, I am embracing this move. The Gophers have made only one NCAA tournament appearance in the past eight years. I guess the one positive aspect of Monson’s lackluster tenure as coach is the drastically low expectations in the minds of the fans. But if the Gophers can make 10 consecutive tourney appearances, four elite eights and a national title? If I don’t have a pen I’ll prick my finger and sign that deal in blood. The question remains is how effective a recruiter Smith will be. The University of Kentucky name packs a big punch in the basketball world. Did they attain top notch talent due to the program’s high-profile stature or because of Smith himself? Whatever the case, I believe in the next two to three seasons the Gophers will be still playing basketball at this time of the year. From excellent adventure to bogus journey. This past week I was in the Philadelphia area for my job. After arriving Monday evening, I met with my boss and co-worker who were also along on the trip. We had a nice steak dinner that night. The week was off to a nice enough start. Tuesday morning we met with colleagues at one of our subsidiary companies in an effort to integrate their procedures into our Minnesota facility (Translation: We gave them notice that we’re eliminating their Finance department). The week went pretty well, without incident, and we were ready to head home Friday morning. That’s when the proverbial roof caved in. We drove to the Philly airport in rain and sleet which caused some trepidation as to how long our flight would be delayed. Turns out we would be only 25 minutes late, leaving at 11:50 am. Once we got to the gate we heard an announcement that our flight would literally be the final one to leave Philadelphia International Airport. As we boarded the plane we were urged to get seated in a quick manor before the weather got more treacherous. Once we got situated the plane did its customary taxiing out on the tarmac to get ready for liftoff. Within ten minutes, the plane suddenly stopped. I awoke from my snooze to take a gander out the window when I felt my jaw drop and my eyes bug out. There were literally 25 other planes in front of ours which were also waiting to take off. At this point, the sleet and rain was coming down heavier which made getting out of Philly less likely. Within seconds of stopping, the captain came over the intercom informing us that each plane needed to be de-iced and that we were approximately number 25 in line. There happened to be another pilot sitting next to me so I decided to inquire as to how long de-icing takes. About 5-10 minutes per plane, I learned. My mathematical mind kicked into high gear and came up with the horrifying answer: anywhere from 2 to 4 HOURS!!! Sure enough, about 3 ½ hours later we were informed that our flight was indeed cancelled and we were going back to the terminal for re-booking. Thankfully my boss is a seasoned traveler. Given the nightmares of her past excursions, she was quick to get on the cell phone to re-book our flights. Once little hitch: there were no flights leaving Philly until Monday. However, the boss managed to book us on flights which were to leave tiny Wilkes-Barre, PA airport at 6:00 am Saturday. That meant we faced the daunting task of somehow driving about 120 miles north in sleet, snow and freezing rain---through the hilly terrain of The Poconos!!! The three of us met a gentleman on the plane who was a Hertz gold club member. After securing the same Saturday flight as us he agreed to drive us north if we would book him a hotel room. Our executive secretary at work managed to find us rooms at the Hilton Garden Inn. The front desk at the hotel conveyed to our secretary that we were crazy to attempt that drive. But what were we going to do? We could sleep in the Philly airport until Monday or start driving north. We obviously chose the latter. And though it took us five hours to drive to Wilkes-Barre (in what is normally a 2 ½ hour trip) we arrived safely. We entered the lobby with a certain smugness about us. We took it as a challenge when they said we’d never make it. However, the brief adulation we experienced was soon dashed when we learned our Saturday morning flight was also canceled. That meant yet another day away from home. I guess the silver lining was that we didn’t get up at 4:00 am Saturday to get ready and go catch a flight that was nixed. In the end, we were re-booked on the 6:00 am flight on Sunday. Since we had nothing but time on our hands Saturday my fellow travelers decided to explore the local mall in the morning. Having only packed for a 5-day trip we were hoping to obtain some fresh clothes. Not wanting to go to the mall I decided to shop for clothes across the parking lot at the local Wal-Mart (HA!! Stick that in your hookah pipes and smoke it, lefties!). I figured I just needed some more t-shirts, underwear and socks. Before that, I was requested to help push our rental car out of the snow drift. While we eventually succeeded in getting the car free the initial effort was futile. The front tires merely spun in place kicking up slush and dirt---and caused me to add two new pairs of jeans to my shopping list. Later in the afternoon we headed next door to the Benagin’s to celebrate St Patty’s Day. After five hours of loud music, drunken patrons and watching the NCAA basketball tourney, I headed back to my room to pack for Sunday’s 6:30 am flight. I landed in Minneapolis at 10:30 this morning and finally got to go home and see my loving wife. All weekend I was being consoled with this “Absence makes the heart grow fonder” gibberish from others who were stranded. I don’t need to be gone more than a day or two before I start missing my gal. But we’re indeed together again and all seems right with the world! In the 1990 Major League baseball draft, the perpetually awful Atlanta Braves had the #1 overall pick. While Atlanta was in the midst of another last place finish, the franchise had reason for optimism. With young pitching phenoms like John Smoltz, Tom Glavine and Steve Avery in the fold, the Braves had a bright future. In the amateur draft that Summer, they were looking to build on that solid core of young pitchers with a can’t-miss high school prospect. A Texas high school kid by the name of Todd Van Poppel was turning the heads of several MLB General Managers and talent scouts. With an explosive 95 MPH fastball and command of his other pitches, then Texas Rangers manager Bobby Valentine declared Van Poppel ready to pitch in the big leagues immediately. As is often the case, a team with the #1 overall pick hones in on a player they want to select. Then the negotiations begin in an effort to sign that player. However, Van Poppel made it known that he had no interest in playing for the awful Braves. He flat out told the organization that if they draft him, he would enroll at the University of Texas which would cause the Braves to lose his rights. The Atlanta brass pleaded but to no avail. Not wanting to risk wasting its #1 pick, the Braves decided to settle for a high school infielder out of the state of Florida. His name was Larry Wayne Jones, Jr., better known to baseball fans as “Chipper”. In Jones’ 12 big league seasons, he has been instrumental in helping the Braves to three World Series appearances, which includes their 1995 championship his rookie season. Jones also has a career batting average of .304 with 357 home runs. As for Van Poppel, he has not pitched since 2004. His 11 injury-plagued seasons saw him make only 98 starts, accumulating a mere 40 wins. Sometimes it’s the deals you don’t make which have a positive impact on your team. Fast forward to 2001. My beloved Minnesota Twins had the honor of selecting first overall in the draft. The most highly coveted player that season was right-handed pitcher Mark Prior of the University of Southern California. The Twins were desperate for a front-line starting pitcher. Prior fit the bill with an overpowering fastball and excellent off-speed stuff. The Twins floated several offers toward Prior in an attempt to reach an agreement on a contract before draft day. Like the Braves with Van Poppel, the Twins were unable to meet Prior’s demands. Instead, the Twins selected a high school kid out of St Paul, MN, whom they expected to be their catcher for many years to come. At least that’s how they tried to sell it to us fans. Cynics like me accused the franchise of pandering to the local base of fans rather than attempting to improve their team. “Why in the world did we draft a catcher?” many fans (including me) wondered aloud. After all, we had A.J. Pierzynski who was only 25-years old at the time and a perennial .300 hitter. Besides, this St Paul kid won’t even be ready for at least a few years. Prior is ready for the big leagues right now!! Two seasons in, it wasn’t looking good for the Twins. Prior, who ended up being drafted second overall by the Chicago Cubs, went 18-6 in 2003 and had his team within five outs of going to the World Series. He had become one of baseball’s premier pitchers. Meanwhile, the Twins had gone out with a whimper in those same ’03 playoffs, losing 3 games to 1 to the New York Yankees. In early 2004 the Twins declared their future superstar catcher was ready for the big leagues. As a result the Twins jettisoned Pierzynski to the San Francisco Giants for three pitchers no one ever heard of. Meanwhile, Prior had already had two solid seasons under his belt and seemed to be living up to the hype surrounding him when he was drafted. Fast forward another three years to Spring Training this season. It has been reported that Prior’s mental and physical stature has taken a turn for the worse. His confidence has been shattered and the velocity on his fastball is only in the 80s. He has missed more than half his starts from 2004-06 due to injuries. The player the Twins selected #1 overall in 2001? St Paul native Joe Mauer, who happened to win the American League batting title in 2006, the first catcher to accomplish such a feat in over 60 years. And how did Prior fare last season? He missed most of ’06 because of elbow problems and had an ERA over 7.00 when he did pitch. In addition to Mauer being an upgrade from the previous catcher, the Twins acquired three potential cornerstone pitchers in the Pierzynski trade. Francisco Liriano (a dominant 12-3 in ’06 before injuring his elbow), Boof Bonser (came up big in his August and September starts in helping the Twins win the division) and Joe Nathan (averaged over 40 saves in each of his three seasons with Minnesota). Just like the Atlanta Braves learned in 1990, the Major League Baseball draft is far from an exact science. Star Wars, The Empire Strikes Back, Return of the Jedi, Raiders of the Lost Ark, The Terminator. Isn’t it obvious given the answers to the first two? Harrison Ford, of course. Ben Affleck, George Clooney, Alec Baldwin. Uh, I sing along with all of the 80s tunes in The Wedding Singer. Without a doubt, United 93. Just one? OK, I’ll go with the Lord of the Rings trilogy (Yeah, I know. That’s three). Will Smith. From the campy 80s rap “Parents just don’t understand” to great performances in Ali and The Pursuit of Happyness. When I was 13 I saw my first Rated “R” movie in my life at the now defunct Minnehaha drive-in. First Blood was the movie. Yes. What’s scary is I can remember the movies and the gals. I made out with (name removed to protect the innocent) while watching Hot Shots in 1991. I then made out with my then-fiancee when we went to see Father of the Bride in 1992. No. There are few where I should have though. I’ve never cried in a theater. I’ve never cried eating popcorn either. Breach. It’s based on a true story. FBI upstart Eric O'Neill enters into a power game with his boss, Robert Hanssen, an agent who was ultimately convicted of selling secrets to the Soviet Union. Hope Floats. Whoever thought Harry Connick, Jr. could do a romantic comedy should be drawn and quartered. Halloween. The theme music alone is enough to cause my heart to jump into my throat. ...and I'm cooped up in meetings. Good thing I have an entire corner of a conference room table to myself, armed with my laptop. Yes, espn.com will have several hits today. With all due respect to ol' crooner Andy Williams, "March Madness" is the most wonderful time of the year. Just to get it on the record, I have the Florida Gators becoming the first back-to-back champs since the 1991-92 Duke Blue Devils. In the 2 ½ years I have been blogging, I have come to know a lot of fantastic people in the Minnesota Organization of Bloggers. About 2-3 times per year, the MOB has a gathering where we all come together and socialize. It’s a cool thing when I finally meet the authors of some of my favorites. In no particular order, these are the blogs I read on a regular basis. Shot in the Dark: This is the first blog I read when I check my internet in the morning. 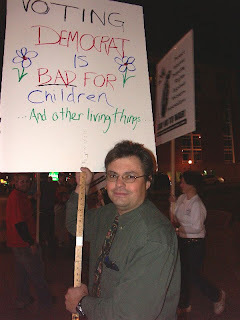 SITD’s author, Mitch Berg, will always be a sentimental favorite because of his promotion of the MN Protest Warriors, of which I am a proud member. I recall Mitch and the rest of the NARN gang having us on AM 1280 the Saturday before the 2004 election. It doesn’t hurt either that Mitch combines the intellect of William F. Buckley with the humor of PJ O’Rourke. Yucky Salad with Bones: This blog by far provides me the most “laugh out loud” moments of anything I read. Described by one critic as “Erma Bombeck on meth”, Katie offers unique perspectives on such areas as family life and popular culture. Whether it’s reading about the incident of her 5-year old daughter Molly getting a game piece from “Battleship” stuck in her nose or the hilarious parodies of “TomKat”, I guess you could say I’m an official “Salad” rube. Hammerswing75: Although I have never met Ben personally, I feel as though I know him. Anyone who is even a semi-regular commenter on my blog is definitely going to be one of my faves! Actually I’ve enjoyed partaking in the details of Ben’s personal journey. It takes a real man to write about a very personal thing like a battle with alcoholism. Thankfully, it appears Ben has taken positive steps forward after confronting that challenge. I now enjoy his musings on his life at Luther Seminary. God Bless ya, Ben! Drop me a line if you would ever like a free coffee or Diet Coke sometime. Kermit the Blog: I’ve actually known Greg since 1999. I have always felt that he has a lot to offer when it comes to blogging. He’ll often forward interesting articles via e-mail with some of the most poignant and thought provoking insights. Unfortunately, Greg is a little preoccupied with family, building a house, working a full-time job, being an entrepreneur, fixing up his current home, weekend excursions to Duluth, etc., etc. For now, Greg’s posts are somewhat infrequent. Nevertheless, I still check out his site everyday in the event he’s able to take a few moments to record those pearls of wisdom. Like his March 13th entry. Psycmeistr’s Ice Palace: I first met Leo (pictured below) in the Summer of 2004 at a Protest Warrior event. While he’s not the most outwardly expressive person, he packs a hard punch to the radical left in his writings. And he doesn’t care much for Jack Murtha I’ve gathered. While I have read many, many blogs in my internet browsing days, that’s merely a list of daily indulgences. I look forward to discovering many more!! A Tale of Two Fathers. -Both were born in 1944. -The two of them have had their respective sons publicly air details of a strained father-son relationship. One is my own father. The other is a certain Republican Presidential candidate. Rudy Giuliani's son seems to think his dad would make a better President than he did a father. "I got my values from my mother," 21-year-old Andrew Giuliani told ABC in an interview quoted on "Good Morning America" yesterday, the same day the Daily News spotlighted the rift between the former mayor and his only son. Of course when I say that the two sons have aired their dismay publicly, Andrew certainly has the advantage in venues. He has ABC TV and the NY Daily News. I have this blog. But I couldn’t help but be struck by the sentiments expressed by Andrew. "I have problems with my father," Andrew told ABC. "But it doesn't mean he won't make a great President." Andrew stressed he still loves his father and said "we are both working on our relationship." I guess as a 37-year old man, I can still learn a thing or two about decorum from a 20-something kid. Andrew Giuliani and his younger sister Caroline, 18, certainly had it much tougher. They were teenagers and under intense media scrutiny while enduring the crumbling marriage of their father and mother, Donna Hanover. My younger brother and I were fortunate in that we were ages one and three, respectively, when our parents split. We have no tangible memories of Dad being around. Growing up in a single parent household was hardly a foreign concept. It will be interesting to hear the comments from my Grandma Carlson if Rudy Giuliani is indeed the Republican nominee in 2008. Grandma, a staunch liberal Democrat, loves to get on her high horse when a GOP political figure has personal failures. I guarantee she’ll express disdain at the fact Giuliani has been married three times. She will also point out how Giuliani was unfaithful to one of his wives and that his relationship with his kids is strained. All the while ignoring the fact her eldest son possesses those exact same attributes. I’m not sure, but it seems to me that Hillary is reading an excerpt from Huckleberry Finn. Conservative commentator Ann Coulter stepped in it this past week at the Conservative Political Action Conference. When referring to Democrat Presidential hopeful John Edwards, Coulter said "I was going to have a few comments on the other Democratic presidential candidate John Edwards, but it turns out you have to go into rehab if you use the word "f**got," so I — so kind of an impasse, can't really talk about Edwards." While I feel Coulter’s comments were incredibly inappropriate, I was rather taken aback by the reaction of DNC chairman Howard Dean. After her comments, Dean issued a press release expressing his outrage. Dean called Coulter’s remarks "hate-filled and bigoted." “While Democrats and Republicans may disagree on the issues, we should all be able to agree that this kind of vile rhetoric is out of bounds. The American people want a serious, thoughtful debate of the issues,” the press release read. "Republicans — including the Republican presidential candidates who shared the podium with Ann Coulter today — should denounce her hateful remarks." Without the need of coercion from Mad How, three of the Republican presidential candidates have indeed condemned Coulter for her comments. However, I find it interesting that Dean himself would be so quick to jump on his high horse. I seem to recall some other instances of “hate-filled” and “bigoted” remarks. Do these gems seem familiar? -"I hate the Republicans and everything they stand for." -"You think the Republican National Committee could get this many people of color in a single room? Only if they had hotel staff in here." Yes, those dandies were offered up by Mad How himself. Is this the “serious, thoughtful debate of the issues” you had in mind there, Dr. Dean? My response to the hate. I’m not certain which scenario draws more irrational and venomous reactions: Is it liberals when they refer to Rush Limbaugh and Ann Coulter or non-Christians talking about Jesus? Since I’ve opined on both subjects this past week, I have received some of the most vile and degrading comments ever seen on this blog. Since I have the ability to moderate all incoming comments, I decide which ones get published. Outside of one commenter whom I banned in November, I typically allow all comments to come through regardless of them being complimentary or divisive. But I am here right now to issue a warning to those who attempt to barrage me with your vitriol. You know who you are. You know what you said. And while you believe you are posting anonymously, the fact of the matter is your identity is known. You stepped way over the line with the hate-filled rhetoric you attempted to pass through. So now you leave me with no choice. What I’m about to convey should not be taken as a threat……but as a promise. I’M GOING TO PRAY FOR YOU!!!! As I have said before, Jesus Christ is indeed my Lord and Savior. I am here on this earth to be a good ambassador for His kingdom. First 100 days of Limbaugh presidency. I can't wait to hear how the rest of the Cabinet shapes up! Goal Update: February weight loss. Well, I didn’t quite replicate the 8 ½ pounds I lost in the month of January. However, I did indeed move closer to my ultimate goal. In February I went from 209.5 lbs to 207.0!! With exactly 12 weeks until my birthday, I have to maintain a one pound per week pace in order to get to my goal of 195!! I can do everything through Christ who gives me strength. One of the hot rumors around the NFL circuit these days has Oakland Raiders WR Randy Moss being traded to the Green Bay Packers. The former Vikings star was a frequent tormenter of the Pack in his seven seasons with Minnesota. From my standpoint, the most intriguing aspect will be the reaction of Packer backers if this trade comes to fruition. For many seasons we heard this sanctimonious bunch say how a player like Moss wasn’t fit to wear the heralded “green and gold”. After all, the Green Bay organization only signs players of good character. Even iconic QB Brett Favre took a shot at Moss after Randy’s idiotic declaration of “I play when I want to play.” Favre said something along the lines of how a player with that attitude would never be allowed to play with the Packers. Of course, Brett was proven a fraud a year later when the Pack turned around and signed the slothful and disruptive Terry Glenn in 2002. I’ve said it before in this space and I’ll say it again: The Packer fans will stoop to touch the hem of a player’s garment if he ever dons the Green Bay uniform. But the minute a player leaves Green Bay to play elsewhere, it must be because he’s no good anymore. I’m convinced that if Favre ever left the Packers to voluntarily play with another team, you’d hear things like “Oh, he was just a pill-popping alcoholic” or “He threw too many interceptions anyhow”. After Moss' mock mooning of the Packer fans during a January 2005 playoff game, the reaction was almost to the point where he should be burned at the stake. But if Randy is traded to the Pack, you can rest assured that incident will be considered a distant memory. Over the past couple of months I have been part of a Bible study group which meets every Wednesday. Last evening’s discussion dealt with the subject of spiritual warfare and how we can resist evil. This may seem to be an oversimplified topic but it’s one that should never be underestimated. For instance, I have absolutes in my life which are not open for debate. I have accepted Jesus Christ as my Lord and Savior. I believe that He was offered up by God to be sacrificed for our sins so we may have eternal life. These are firmly held beliefs of mine which no evil spirit can wrest away from me. However, the enemy is very subtle. He’ll attack us on levels where we may not be acutely aware we’re being persecuted. It can be simple things which distract from developing an intimate relationship with Jesus, whether it’s a sporting event we attend, something on TV to watch, etc. Now I’m certainly not condemning those activities. But how often are people talking about “the big game” or the latest reality show craze as opposed to Jesus? For me, it was NFL football. On Sundays I use to be this raving lunatic whenever I watched the Minnesota Vikings play. I would often do and say things which, admittedly, were not “Christ-like”. Letting a football team dictate my well-being was beyond absurd. As a result, I no longer partake in watching the Vikings play. What about consumption of alcohol? While it’s never been something I’ve enjoyed to excess, it certainly isn’t sinful to have a glass of wine with dinner or enjoy a can of beer on a hot summer day. But for those who have struggled with being an alcoholic, just one drop of such beverages could plunge said alcoholic back into the depths of drunkenness. The one consistent prayer my wife and I convey is that we want to be good ambassadors for the Kingdom of God. Unfortunately, I have occasionally fallen short in that area (as evidenced by some things I have written in this space before). That is why I have resolved more than ever to embrace each and every day as an opportunity to be a blessing unto others. The fact of the matter is Satan will use any situation in an effort to keep us from reaching non-believers. The failings of such high profile men of God like Jimmy Swaggart, Jim Bakker and Ted Haggard has resulted in some people questioning the Christian faith. Some have even gone so far as to take pleasure in their demise. As it says in 2 Corinthians 4:4, “The god of this age has blinded the minds of unbelievers, so that they cannot see the light of the gospel of the glory of Christ, who is the image of God.” Unfortunately, Swaggart, Bakker and Haggard all succumbed to the temptations of this world. They were definitely sought by the devil himself because of the hundreds of thousands which came to know Jesus as a result of their respective ministries. I would venture to say that nothing inflames the enemy more than souls being saved. One passage I always lean on is 1 Thessalonians 5:18, which says “give thanks in all circumstances, for this is God's will for you in Christ Jesus.” We certainly aren’t thankful for the circumstances surrounding the aforementioned ministers. But in their circumstances, we learn a valuable lesson: Until the day the Lord calls us home, there is a constant battle for our souls. We must maintain our resolve against an enemy who seeks, kills and destroys. And that resolve all starts with his Word. Wow, I could get use to this! At about Noon today, there was an announcement in our office saying we could leave for the afternoon due to the blizzard conditions. I suppose it's too much to ask to make this a permanent thing.